and “Peace Crawls” – Mobilize Workers Power! The imperialist rulers of the United States are gearing up to carry out a horrendous slaughter in Iraq. Already over tens of thousands of U.S. troops are in the region, with more streaming in daily to assemble an invasion force of over a quarter-million military personnel. Thousands of tanks, hundreds of air forces fighters and bombers, the most advanced weaponry – all poised to rain death and destruction on the Iraqi people. Whenever George Bush decides that he has had enough of the charade of United Nations “weapons inspection,” the Pentagon murder machine will be unleashed. Tens and hundreds of thousands are slated to die. Around the world several million people have marched against war on Iraq. Yet innumerable peace parades haven’t fazed the cold-blooded killers who run this country. Neither have fatuous debates in the UN Security Council, or the absence of the slightest evidence that the government of Iraqi strongman Saddam Hussein has or is developing “weapons of mass destruction.” The U.S. military are more concerned about what they may face on the ground in Iraq. Demonstrations by armed civilian militias in Baghdad underscore that however massive the bombing, there could be bloody street fighting in the Iraqi capital and elsewhere. But the prospects of American casualties won’t stop the warmongers in Washington, either. The military ideologues who are running the show are fed up with gun-shy generals, and figure that the best way to bury the “Vietnam syndrome” (of fear of losing wars in semi-colonial countries) is to have a brutal victory, in which some U.S. soldiers get killed. But Iraq is not Afghanistan, and they may not get the quick and easy war they are counting on. The Bush gang’s aggressive strategy could backfire, but the stakes are high and they are willing to take the risk. Yet instead of the promised order, there was an explosion of nationalist bloodletting and increasing tensions with the U.S.’ NATO allies. The government of Bush Jr., staffed by veterans of his father’s administration, is determined to “finish the job.” They are targeting not only Saddam Hussein’s Iraq, but also North Korea, China and Cuba. And they are determined to prevent a regrouping of the U.S.’ imperialist rivals with Russia, with its still substantial stock of nuclear weapons and delivery vehicles. With the U.S. hand firmly on the Near East oil tap, Washington figures it can keep the rest of the world in line. It is important to understand that the war on Iraq is also a war on working people, the poor, Blacks, Latinos, immigrants and other oppressed sectors in the U.S. Even after the collapse of Enron – which severely shook the stock markets, already reeling over the bursting of the technology “bubble” – the White House came right back with a plan for tax cuts in which most of the benefits would go to the richest 1 percent of the population. When anyone objects, Bush accuses them of advocating “class warfare.” The Democrats rush to say, “not us” – for they are representatives of the capitalist class just as much as are the Republicans. So they end up voting for Bush’s foreign wars, domestic repression and pro big business economic policies. Bush is right to suggest that any real opposition to his policies would have to be class war, for that is what he is waging. He won’t get such opposition from the Democrats. In fact, most of the plans for increased domestic repression, the phony “war on terrorism,” the looming attacks on Iraq and North Korea, were drawn up under the Clinton administration. The leaders of the popular-front “antiwar movement” also play by the rulebook of the bourgeois political game, and precisely because of that they are unable to mount a real opposition to imperialist war. If they want to get Democratic “doves” on their platforms, they have to tailor their program to what these bourgeois politicians will accept. 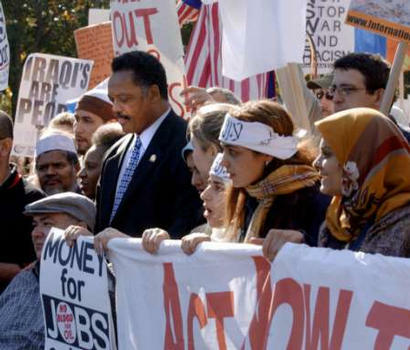 Jesse Jackson carrying social-patriotic slogan “Money for Jobs, Not for War,” leads October 26 “antiwar” march on White House after defending 1991 Gulf War. A dramatic example was at the October 26 demonstration in Washington, D.C. when black Democrat Jesse Jackson spoke from the platform. Jackson declared, “Some wars are necessary…. Getting Saddam out of Kuwait was necessary.” Many youths in the crowd were shocked at this grotesque defense of the first Gulf War, which slaughtered over 100,000 Iraqis, but it’s hardly surprising from Jackson. The demonstration organizers certainly knew what to expect, for the A.N.S.W.E.R antiwar coalition is run by the Workers World Party (WWP), which for years specialized in organizing demos for Jackson. And even after his speech, they were careful to put him at the head of the march past the White House. The other main speaker in Washington was Ramsey Clark, founder of the International Action Coalition (another group led by the WWP) who started off with a eulogy for the thousands of U.S. soldiers who died in Vietnam and whose names are on the nearby Vietnam War Memorial. Clark did not mention the millions of Vietnamese killed by the U.S. in that counterrevolutionary war. It should be recalled that Clark was the head of the Justice Department under Lyndon Johnson, when antiwar demonstrators were chanting “Hey, hey, LBJ, how many kids did you kill today?” Clark was the U.S.’ “top cop” and boss of the FBI, and authorized the war by FBI chief J. Edgar Hoover against the Black Panther Party that left scores of Panthers dead and hundreds in jail. How can you fundamentally oppose imperialist war in alliance with defenders of imperialist war and organizers of capitalist repression? Answer: you can’t. But seeking a “coalition” with such representatives of the ruling class is the entire program of the “peace” groups. In 1971, the main builder of the popular-front “antiwar movement,” the Socialist Workers Party, drew the class line in blood by beating up leftists (supporters of the Spartacist League and Progressive Labor Party) who protested the presence of Democratic Senator Vance Hartke and union bureaucrat Victor Reuther (a longtime bag man for CIA subversion of unions overseas) at a “National Peace Action Coalition” meeting. As a direct consequence of this pandering to the bourgeois liberals, there has been an outbreak of anti-Communist redbaiting among these “disparate forces.” The “peace is patriotic” crowd has gone after A.N.S.W.E.R. by pointing to the WWP’s support to North Korea, and attacks the Maoist Revolutionary Communist Party’s role in the “Not In Our Name” (NION) coalition. Interestingly, this comes not only from the liberals around The Nation but also from the rad-lib friends of Noam Chomsky in Z-net. Even the ISO has gotten some flak from its liberal and Green Party allies who want to counterpose the “war on terror” to the war on Iraq and wrap themselves in the American flag. This McCarthyite witchhunting is the logical outcome of the nature of this class-collaborationist movement. Rejecting a “red” struggle for socialist revolution, the parlor pinks get into trouble with their red-white-and-blue liberal allies. The program of class collaboration is also shown in the demands raised by the various competing and cooperating antiwar groups. Currently, there are A.N.S.W.E.R., led by the WWP; “Not In Our Name,” in which the RCP plays a prominent behind-the-scenes role, along with the Communist Party U.S.A., and various liberal pacifist groups. The social-democratic International Socialist Organization (ISO) participates in both. Despite organizational maneuvering and competition, the political differences between these Stalinist and social-democratic reformists are minimal to non-existent. All of them present one form or another of social-pacifist and social-patriotic politics. Social-patriotic slogans of antiwar popular front. 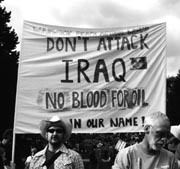 What they mean is no American blood for Iraqi oil. “Not In Our Name,” favors the slogan, “No Blood for Oil.” Control of oil supplies certainly plays a key role in the looming invasion of Iraq, and a lesser role in the preceding war over Afghanistan with the oil riches of the Caspian and former Soviet Central Asia (dubbed “Pipelinestan” by some journalist wags) in the background. For example, Democrat Clinton’s 1999 war on Yugoslavia, which was ostensibly about human rights and actually about the NATO imperialists carving up Southeast Europe. It’s not accident that quite a few of the liberals populating the “NION” coalition were supporters of that imperialist war. Like Jesse Jackson, they just don’t like this war. Appealing to liberals who blanch at the thought of taking a side with the people of Iraq against U.S. aggression, the reformists leave vague the question of whose blood will be flowing massively as a result of this war. They attack the how of the war (like how much it will cost), not the “why” – imperialism, which as Lenin stressed is capitalism in its epoch of decay. Another slogan that was prominent in the October 6 demonstration sponsored by NION in New York City’s Central Park, which drew some 25,000 protesters, was “regime change begins at home.” Again, at first glance this may seem radical, but what’s behind it is the demand that the Republican usurper Bush, who was “elected” by a 5-to-4 majority on the Supreme Court, should be replaced by a Democrat. Similarly, when all of these coalitions denounce “Bush’s war,” it is a clear appeal to rope in Democrats. Yet another common denominator demand, especially favored by WWP/IAC/A.N.S.W.E.R, is “Money for Jobs, Not for War,” or variants such as “Money for Schools, Not for War.” Again this is an appeal to bourgeois liberals who support American capitalism, but are worried about their favorite social programs getting crowded out by the “bloated” Pentagon budget. Reformists like such slogans, because they argue that the middle class can only won over by appealing to their wallets and pocket books. So the “peace” coalitions adopt a dual marketing strategy: for the youth, “multi-culti” slogans about the plight of the Iraqis; for their parents, “butter vs. guns” social-patriotism. The current issue of Workers World (16 January) is quite explicit about this, with an article titled “Guns for the Workers, Butter for the Rich.” Another example of these same theme is the front for the ISO’s Socialist Worker (8 November 2002), which proclaims: “Billions for Iraq war, tax cuts for the rich, No help for the jobless: Washington’s Twisted Priorities.” As if imperialist war is simply a question of budget priorities rather than mass murder by the U.S. bourgeoisie (and not just Bush). Perhaps the most absurd example of this utopian-reformist and economist approach to war was in the 1980s, when Socialist Action’s Silvia Weinstein campaigned for childcare centers on the slogan, “It will be a great day when the schools get all the money they need, and the Navy has to hold a bake sale to buy a ship.” Again, this poses the question of what their attitude would be if the government wasn’t cutting social programs. For example, Democrat LBJ fought the war on Vietnam on the program of “butter and guns,” spreading around a lot of money to anti-poverty groups and launching the Medicare program. At bottom, all these demands are what Lenin termed “social-patriotic” and “social-pacifist.” In other words, they seek to channel opposition to a particular imperialist war into a dispute over the “priorities” of bourgeoisie rather than into a fight against the capitalist system which produces such wars over and over. A look at the origin of the slogan of “butter vs. guns” can help to see why this is rejected by revolutionary Marxists. In 1936, Hitler’s deputy Hermann Göring, who had just been put in charge of the economic program for rearming Germany, announced at a mass meeting in the Berlin Sports Palace that the new watchword would be “Kanonen statt Butter” (guns instead of butter). A couple of years later, the Volksfront (Popular Front) of the Social Democrats (SPD) put out a ten-point program titled “German Freedom” calling for “Butter instead of guns.” Their answer to Hitler’s aggressive militarism, which threatened to unleash a new imperialist war, was a dispute over budget priorities. The task of those who would fight the Nazi dictatorship drive toward war was not to argue about its spending priorities, but rather to fight for its overthrow through workers revolution, something dissident bourgeois politicians could never support. Today, the central question posed by Washington’s drive toward war is not to focus on relative spending but the need to defeat the imperialists and defend Iraq through sharp class struggle. In the first Gulf War, the then-revolutionary Spartacist League raised as its central slogan, “Defeat U.S. Imperialism! Defend Iraq!” Today it has demonstrably dropped the call to defeat “its own” bourgeoisie as part of a sharp rightward shift (see “SL Hard to Starboard,” The Internationalist No. 15, January-February 2003). 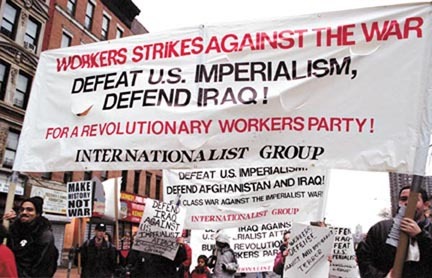 The Internationalist Group and League for the Fourth International have called for workers action against the war on Iraq, including labor strikes and boycotting war materiel. In contrast, the bulk of the left is intent on building a bigger, better and “broader” popular-front antiwar coalition – that is, looking to the liberals rather than to the working class. Recently a number of local unions have passed antiwar motions (Chicago teachers and Teamsters) and linking the government’s anti-labor repression to the war on Iraq (Oakland longshore workers). But passing paper motions will not stop U.S. tanks – what’s needed is the mobilization of the power of the workers movement directly against the war drive. The recent action by British train engineers in refusing to move a freight train loaded with munitions bound for the Gulf is an important development, which should be taken up by class-struggle militants internationally.